Product prices and availability are accurate as of 2019-04-17 23:56:41 UTC and are subject to change. Any price and availability information displayed on http://www.amazon.com/ at the time of purchase will apply to the purchase of this product. Operated by key outside and inside. 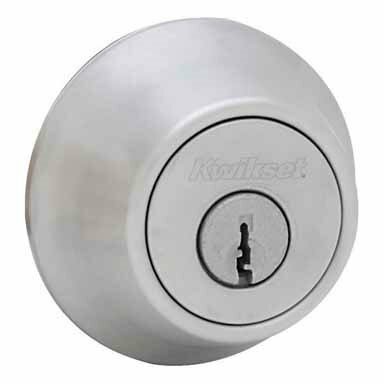 Security deadbolts feature full 1" solid core throwbolt all metal mechanisms anti-pry shield and pick resistant 5-pin system. DOOR PREP: 2-1/8" Crossbore; 1" Edge Bore; 1" x 2-1/4" Latch Face. BACKSET: adjustable 2-3/8" to 2-3/4". DOOR THICKNESS: Fits 1-3/8" to 1-3/4" doors. CYLINDER: 5-pin. FACEPLATES: 1" x 2-1/4" round corner. STRIKES: 1" x 2-1/4" round corner. BOLT: 1" throw. HANDING: Reversible for right or left handed doors. ANSI/BHMA: Grade 3.